“Historically, super-tall buildings have focused on structural challenges . . . The challenges, solutions, and opportunity exist for Boston to pivot now from its fossil-fueled past and lead the transition to clean energy; this means moving our building designs into the 21st century through a relentless focus on efficiency and cost-effective switches from gas and other fossil fuels to clean, electricity-based heating/cooling. 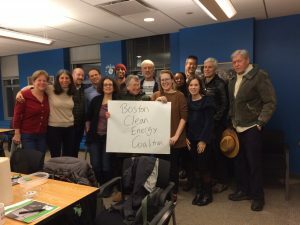 The Boston Clean Energy Coalition (BCEC) brings together member organizations and allies in the shared commitment to accelerate this shift away from natural-gas–driven energy in Boston’s buildings and toward construction fueled by renewables. Meeting this goal requires collaboration among all of Boston’s sectors: developers, elected officials, labor, investors, utilities, neighborhoods, faith-based groups, academia, environmentalists, and others. By providing an organizing space that fosters this process and promotes this collaboration, BCEC looks to spur innovative and transformational public policy that unwaveringly focuses on a green and clean future. Net-Zero-Carbon Municipal Buildings for Boston? On March 21, 2019, Councilors O’Malley and Wu held a City Council hearing as a first step to determining if they have support to require that all new municipal buildings henceforward will be net-zero carbon (NZC). This makes sense as the only course of action in light of the findings of the Carbon Free Boston Summary Report, released earlier this year. (See post below for more details about that report.) The report indicates that to meet the goal of being carbon neutral by 2050 promised by Mayor Walsh, all 87,000 buildings in Boston need to be NZC; any new construction henceforward should be NZC at the outset or it will just need to be retrofitted at great expense at a later date. In January 2019, BU’s Institute for Sustainable Energy delivered the much-anticipated Carbon Free Boston Summary Report. The report evaluates key strategies across the building. transportation, waste, and energy sectors to inform the City’s Climate Action Plan update and is meant to provide a pathway based on real-world data by which Boston can reach carbon neutrality by 2050. Councilor O’Malley’s first order of NZC business in the new year was to refile (per City Council requirements when a new calendar year begins) hearing orders. Toward this end, on January 16, he refiled a slightly reworded order to amend the definition of the floor area ratio (FAR) when developers are constructing a net-zero-carbon building as well as an order requiring all new municipal buildings be net-zero carbon. In an effort to bring transparency and social accountability to the use of the City’s pension fund investments, three city councilors will hold a hearing open to the public on Feb. 28 at 2 pm. Public and written testimony accepted. Here is why we need all new buildings in Boston to work toward being net-zero carbon, and we need to do it now since we are in the midst of the third largest building boom Boston has ever witnessed.